More than 150 guest principals shadowed Long Beach Unified School District principals last week during the annual Principal for a Day event. Afterward, the guest principals, educators and community leaders gathered for a debriefing at the Beverly O’Neill/Center Theater. Participants in a Q&A session at the debriefing included U.S. Congressman Alan Lowenthal, California State Assemblyman Patrick O’Donnell, Long Beach City College Superintendent-President Eloy Ortiz Oakley, LBUSD Superintendent Christopher J. Steinhauser, local entrepreneur Chad Sammeth and Long Beach Mayor Robert Garcia. “Thank you for supporting our incredible schools across Long Beach,” Mayor Garcia told the audience. “Thank you to our incredible Board of Education, because what we have here, nobody has anywhere else – the relationships, the teachers, the parents, the PTAs – we have a world class system. Students from the Harmony Project also took the stage at the theater. The school district began partnering with the nonprofit Harmony Project this school year, allowing students to learn how to play violins, violas and cellos as early as second grade. Lowenthal, O’Donnell, Long Beach Police Chief Robert Luna and other dignitaries honored Long Beach Education Foundation President Mike Murray of Verizon with praise and proclamations for his longtime involvement in the Foundation and local schools. HARMONY PROJECT - Jose Rivera of Chavez Elementary School performs with the Harmony Project at the annual Principal for a Day debriefing. 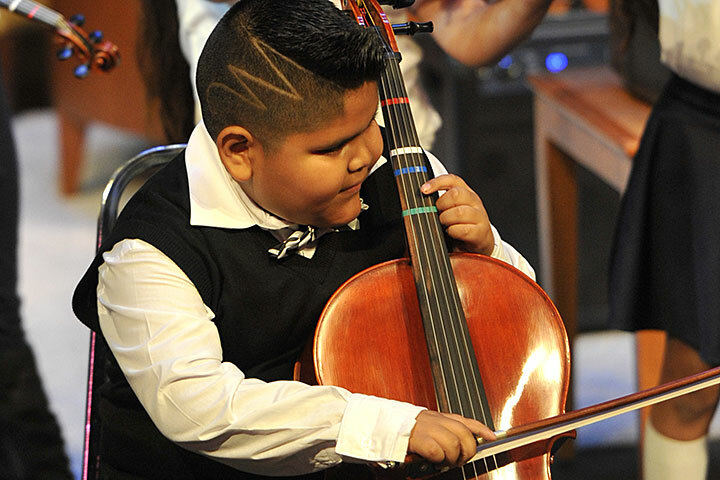 The school district began partnering with the nonprofit Harmony Project this school year, allowing students to learn how to play violins, violas and cellos as early as second grade.